What makes a pumpkin a GREAT Pumpkin? Charlie Brown knows the answer, but he's still waiting out in the pumpkin patch for his great pumpkin. For the rest of us, there are G R E A T pumpkins to be had now, with no waiting. 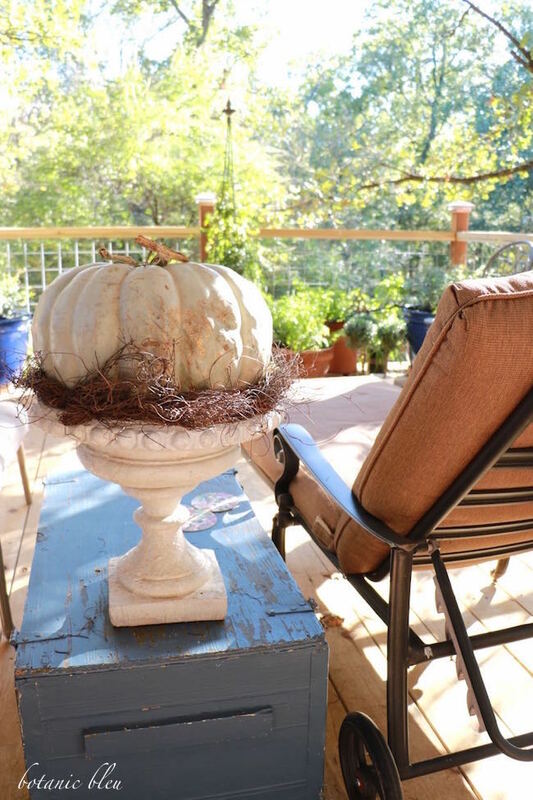 Here's what makes a great pumpkin for our decks, our patios, our porches. The S T E M has to have character. 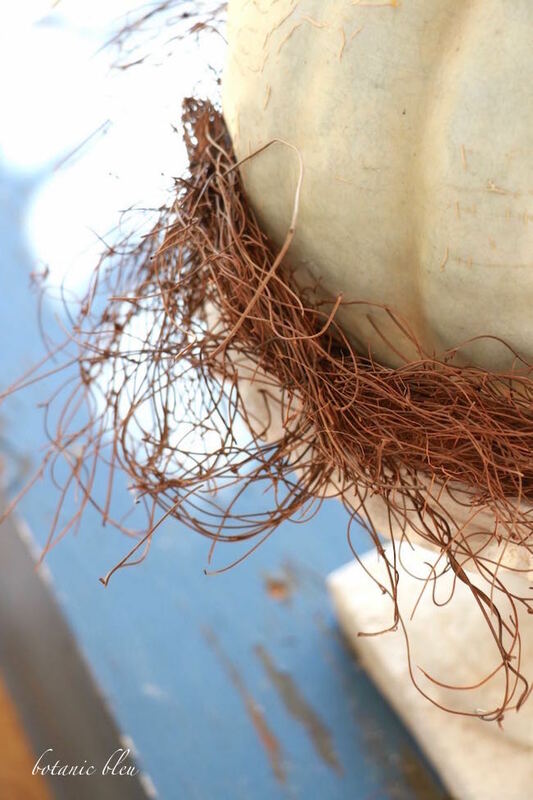 It's not enough for it to be sturdy, nourishing the pumpkin throughout its formative months while still on the vine. No, the stem needs twists and turns, with a definite personality that catches your eye right away. Then there's C O L O R! When did all these non-traditional colors hit the market? Green, white, peachy, gray, red orange.... A soft green goes well with a white urn container AND the still green background trees and deck plants. The calendar says, "FALL," but the landscape still looks like summer. A few distinguishing blemishes are okay. They add even more interest to the pumpkin. 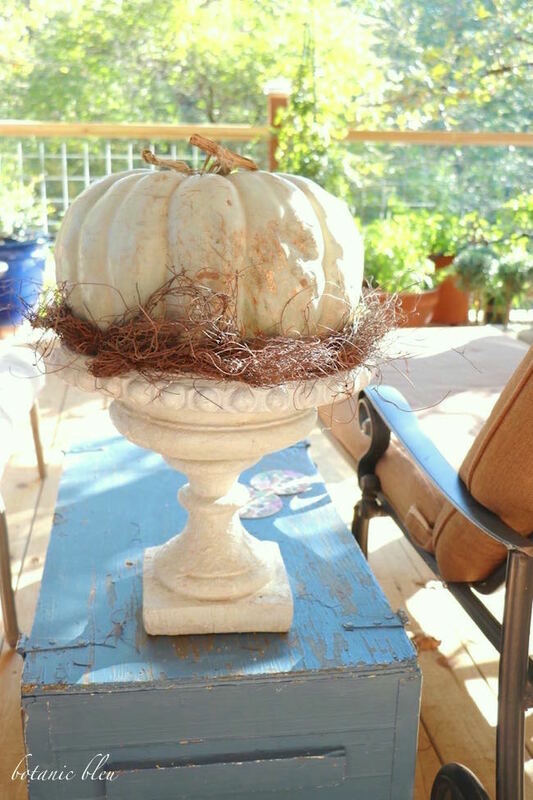 The S H A P E can be round, oblong, tall, or even squat, but the great pumpkin for my porch is spherical filling the white urn. 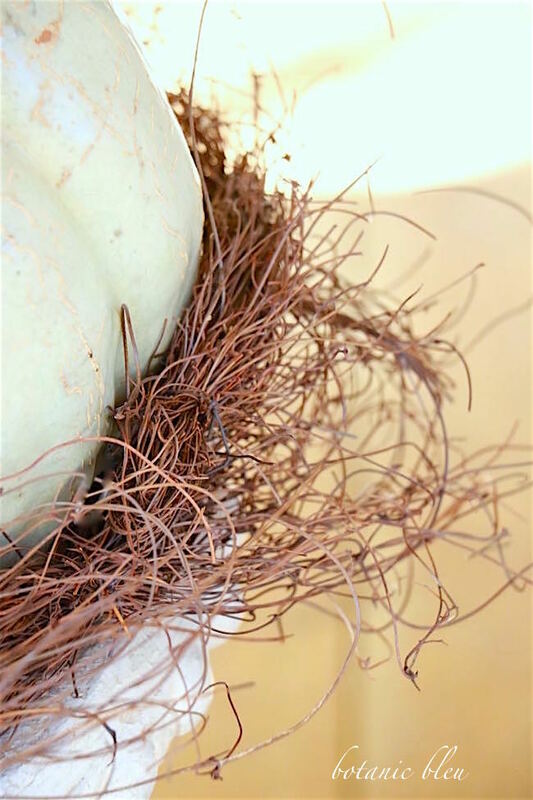 The unkempt squiggly vine wrapped around the pumpkin base nestles the great pumpkin into the urn. 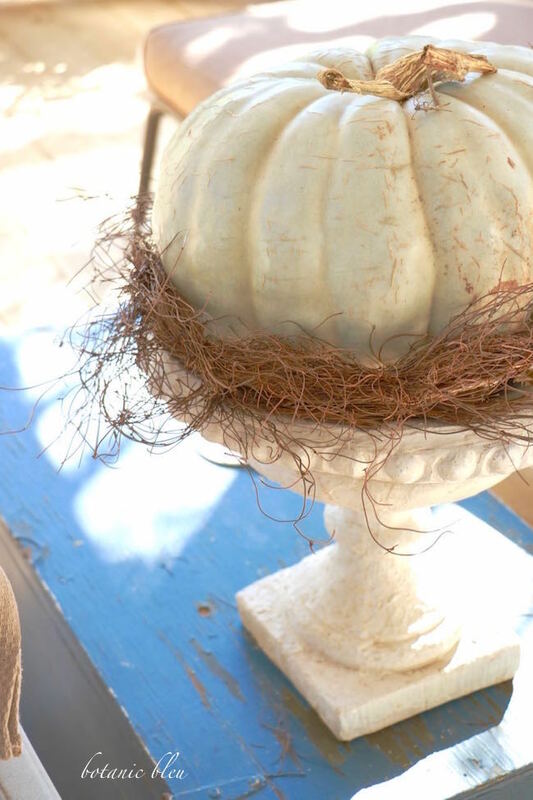 A pumpkin this great deserves a stately French-style urn as its home. The wild vine anchors the rustic pumpkin and provides a transition from the formal style of the urn to the blemished natural pumpkin. 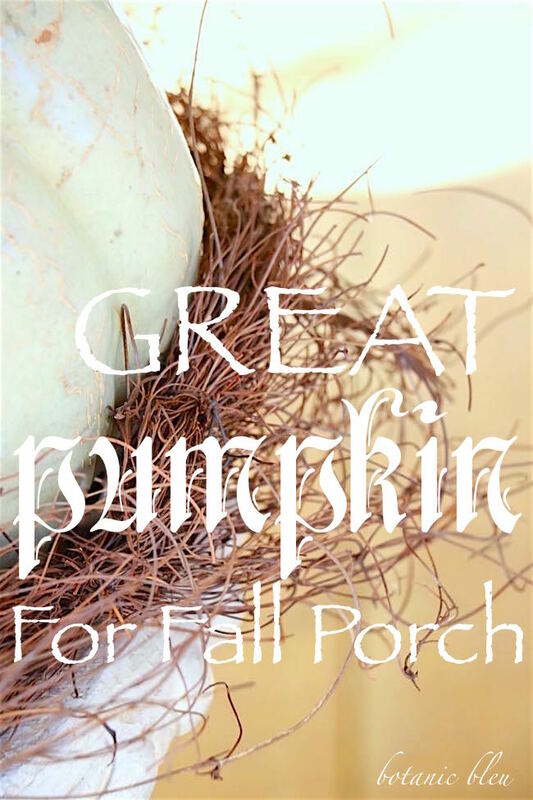 Do you have a GREAT pumpkin on your patio, your deck, or your porch? What are its stem, color, and shape like? You may also enjoy seeing these GREAT pumpkins from previous years. 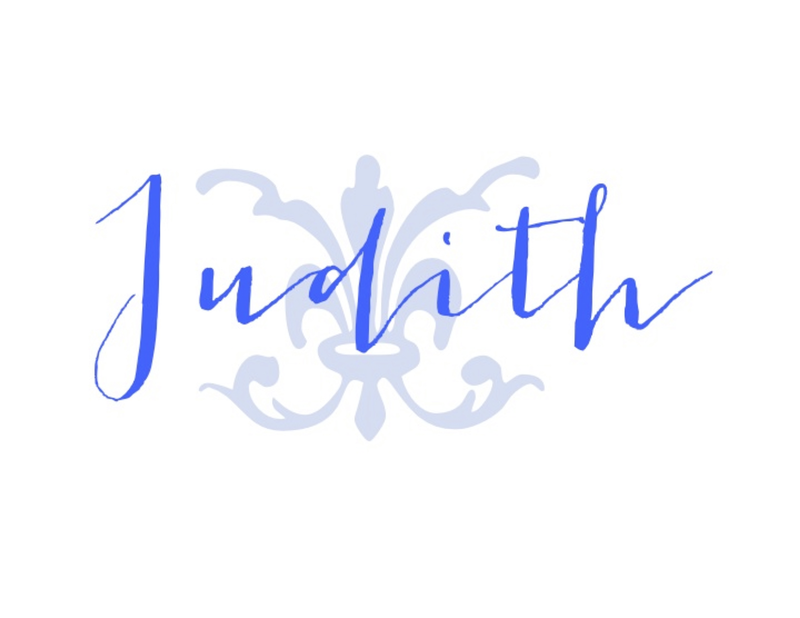 You've chosen the perfect pumpkin for your urn, Judith, and I love the twiggy vine that it's sitting on! I love it all! 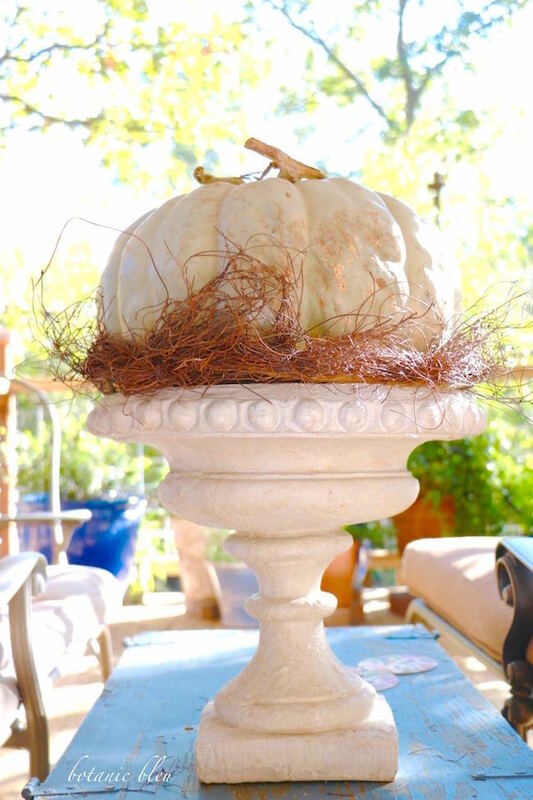 I think I'll borrow your idea of nestling a pumpkin in my concrete urn- so much more interesting than plopping it on my porch. And I love the blue color of the trunk it's sitting on. 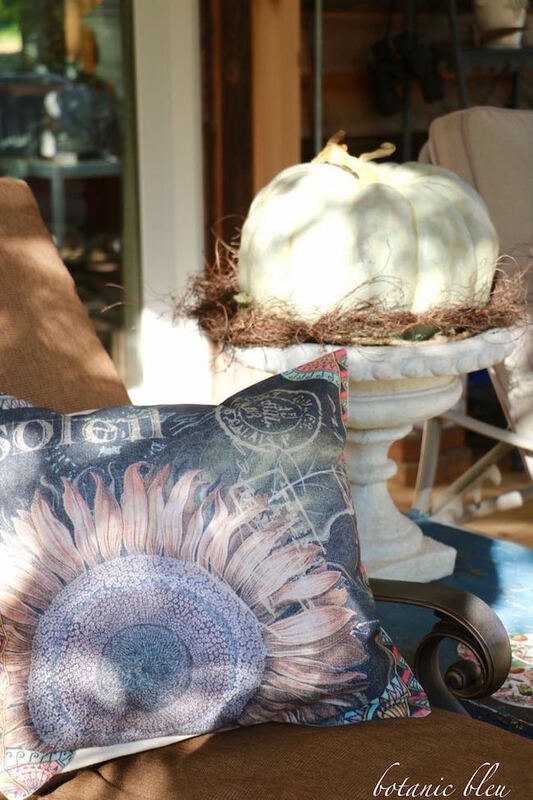 This is a pretty pumpkin and perfect for our southern fall that still feels like summer. I tried growing pumpkins this year but my seeds were bad, couldn't get them to germinate which was odd. I guess it was Gods way of telling me I didn't need any more additional work. 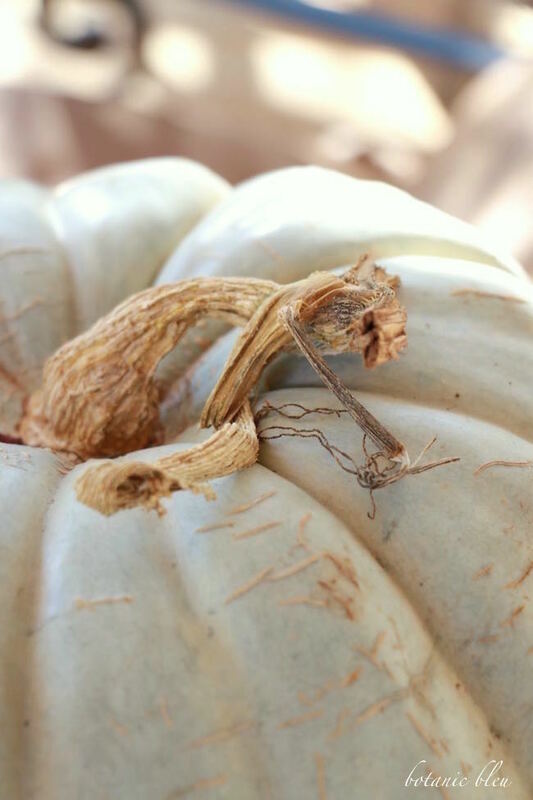 I agree about the stem it has to have character and what I noticed recently from the stores the the pumpkin patch many places cut those stems. So next year the plan is to grow my own but I think I'll stick with traditional orange. Charlie Brown... he's the best..
Judith, your pumpkin looks wonderful in that beautiful urn. You picked the perfect one! I hope that you have a happy and blessed day!!! I adore Charlie Brown and your pumpkin as well! Your Southern porch is dreamy. 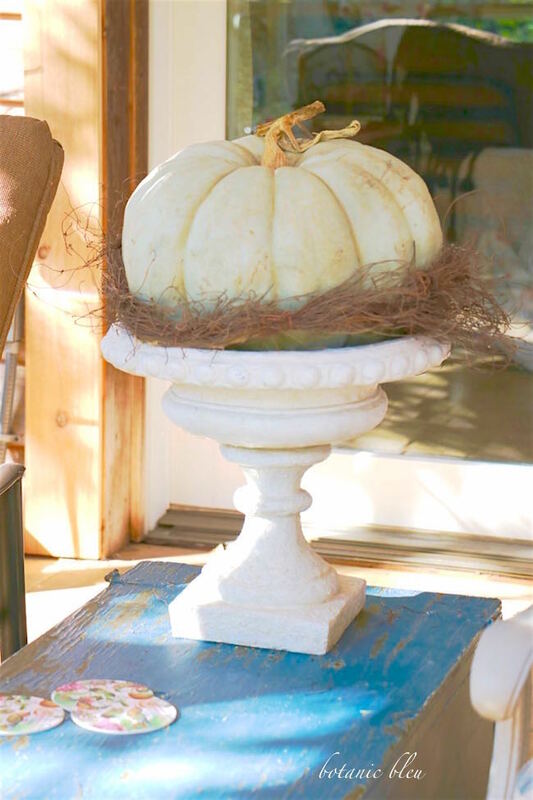 What a beautiful pumpkin you have, and I love the way it's displayed in the urn. For some reason, I never think to do that. It really gives the pumpkin a sense of display. I think I'm going to hunt down some vines, too. You've given me a great idea! I have 2 orange pumpkins, slightly off-kilter but with great stems, in front of the house. I never carve jack-o-lanterns because I like to have them on display through Thanksgiving. I love what you did here. Beautiful! I have yet to get a pumpkin. We will be visiting my favorite produce stand this weekend and I have plans to get a pumpkin. I like how the colors and shapes have extended beyond the traditional Orange. I like the Heirloom pumpkins you see a lot of now. I had never even looked at the stems on pumpkins until this year. And, Steve took his pumpkin choice seriously - great shape, easy to carve and a serious stem. I believe in The Great Pumpkin! 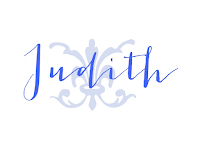 You put so much effort into your beautiful posts and I thank you! I ordered these French heirloom pupkins seeds this year. I grew them and the pumpkin vine was gorgeous. It was full of blooms and a few baby pumpkins, then it rotted, due to all of the rain. I will try again next year. I would love to grow the perfect pumpkin. Yours is beautiful!